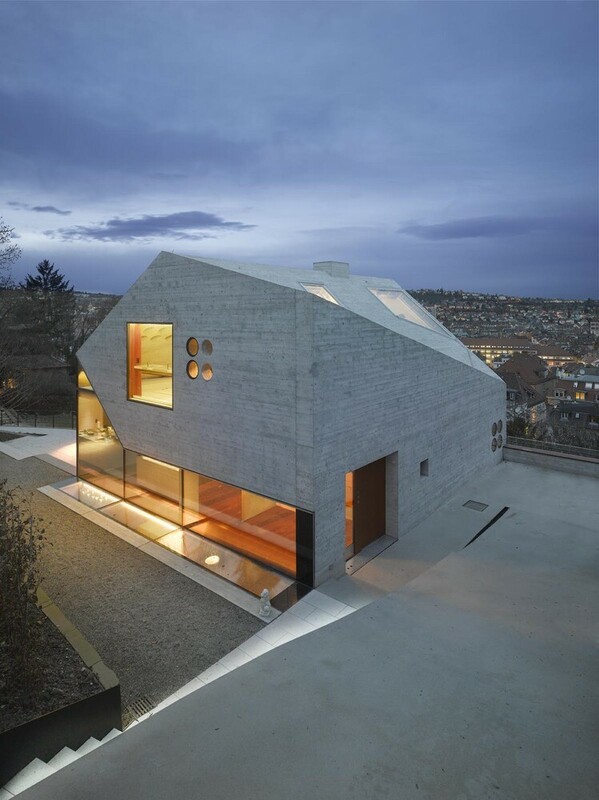 House 36 is a project conceived by Matthias Bauer Associates in Stuttgart, Germany. 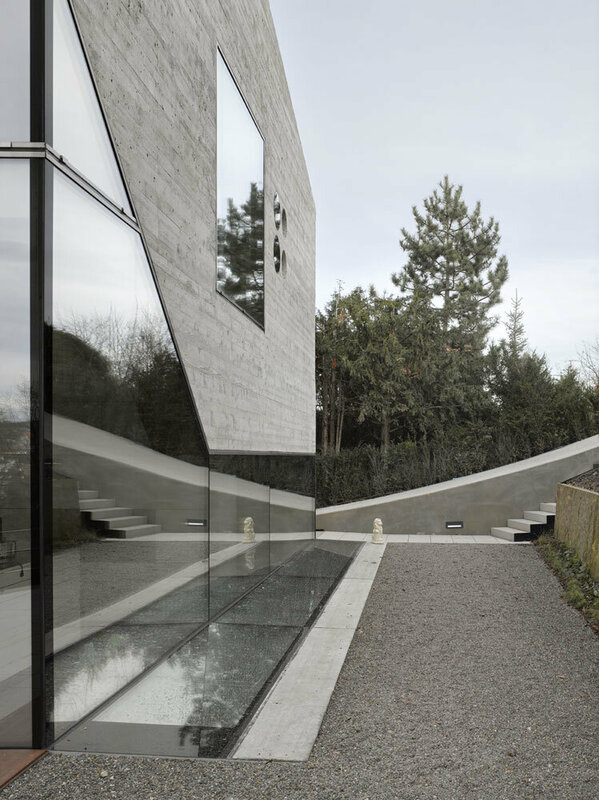 Description by Matthias Bauer Associates: Combining a stone cavern with a glass house, the building is shaped like a mountain crystal. 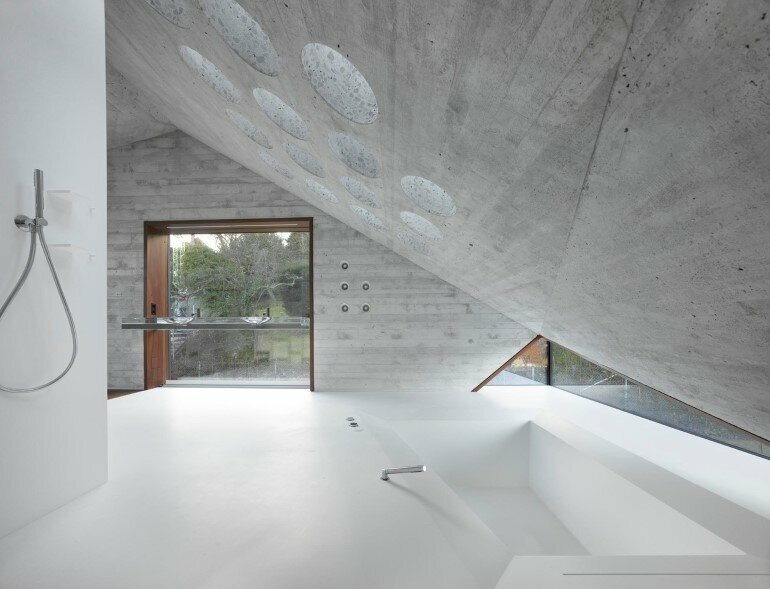 The jointless walls and triangulated roof are made of monolithic insulating concrete. 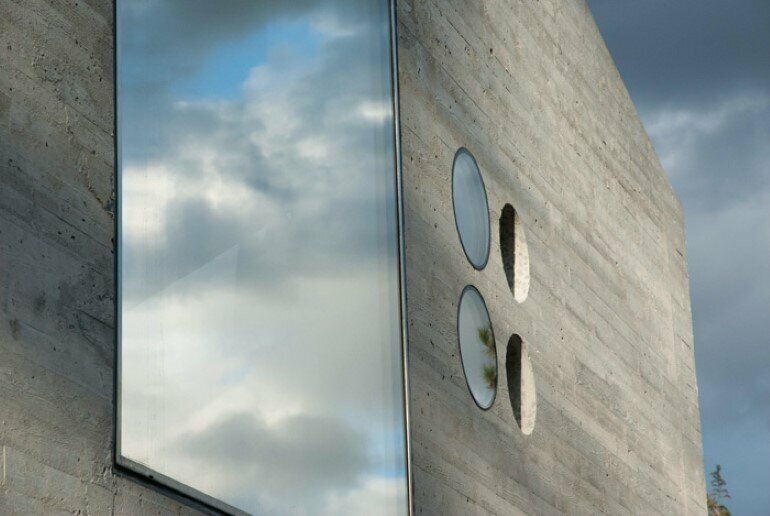 Uniting structure, insulation and technical installation in one massive layer beautifully balanced by the transparent and reflective nature of glass. 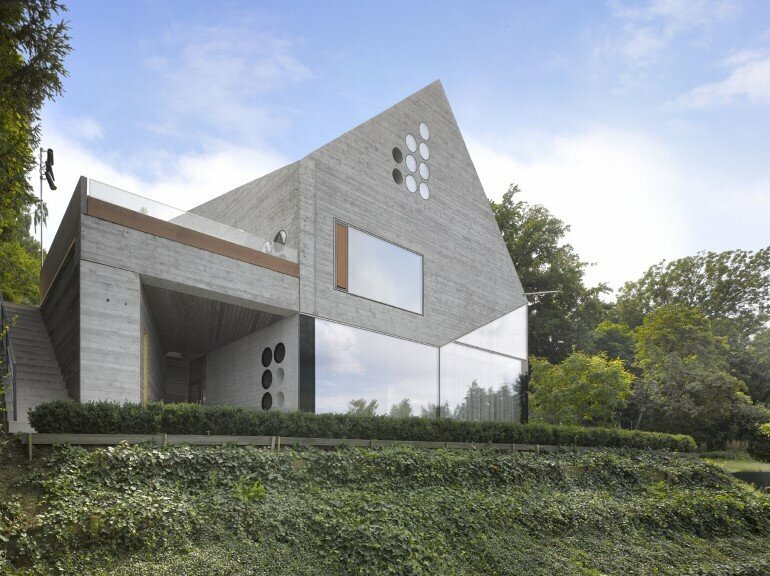 In a strong engagement with context, site, and material the architecture of House 36 blends with the natural beauty of a steep site overlooking the urban valley of Stuttgart. 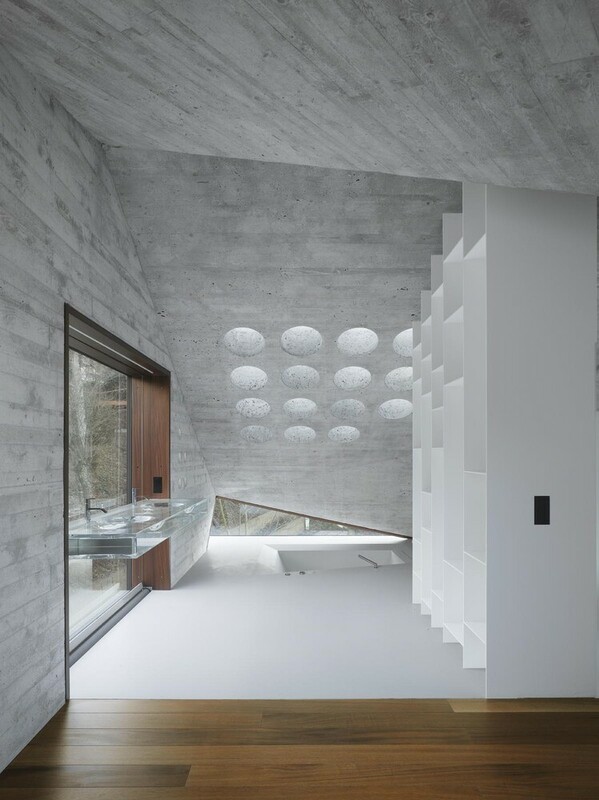 It is made of a smart and warm concrete with rough-saw texture inside and outside – ideal for the desired variety of contemporary spaces and atmospheres. Closed towards the hill and upper road while open towards the green spaces and the view over the city and towards the sky. 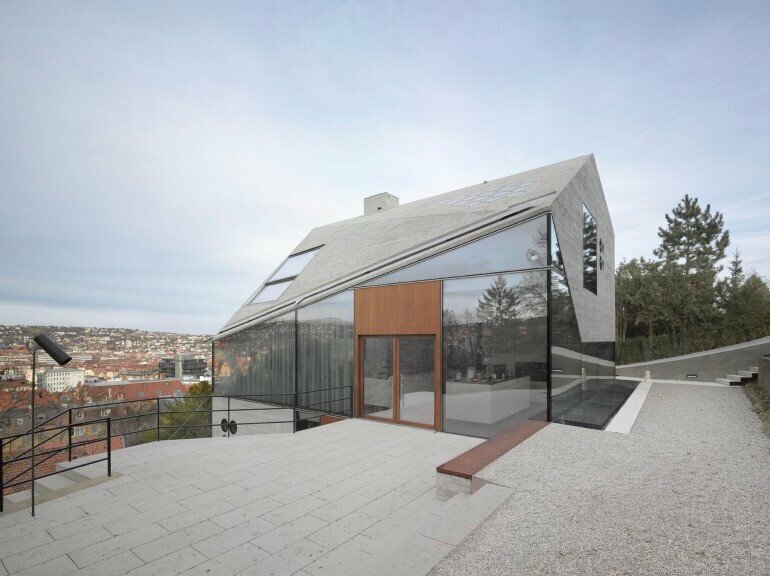 The walls and triangulated roof geometries of House 35 are complemented with a flush mounted glass band, creating a contextual and unique architecture of both protective and open spaces to live. 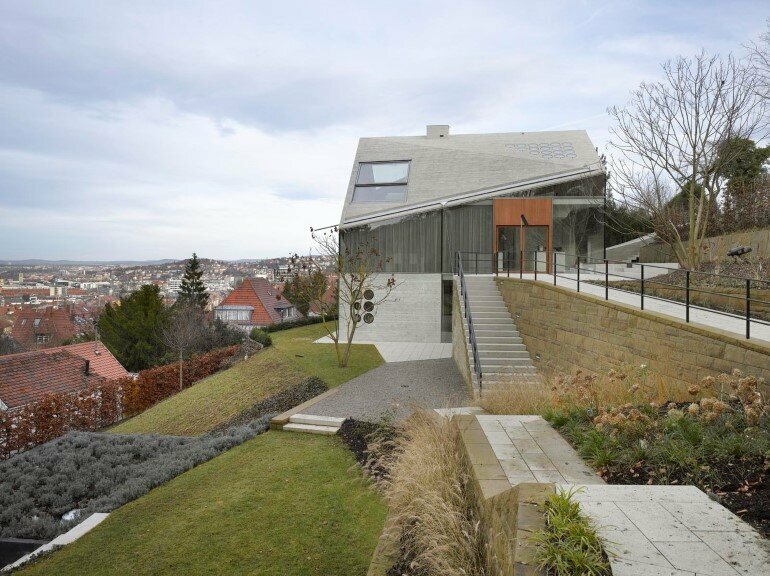 From the distance the house blends into the residential context harmoniously with its triangulated sloped roof. 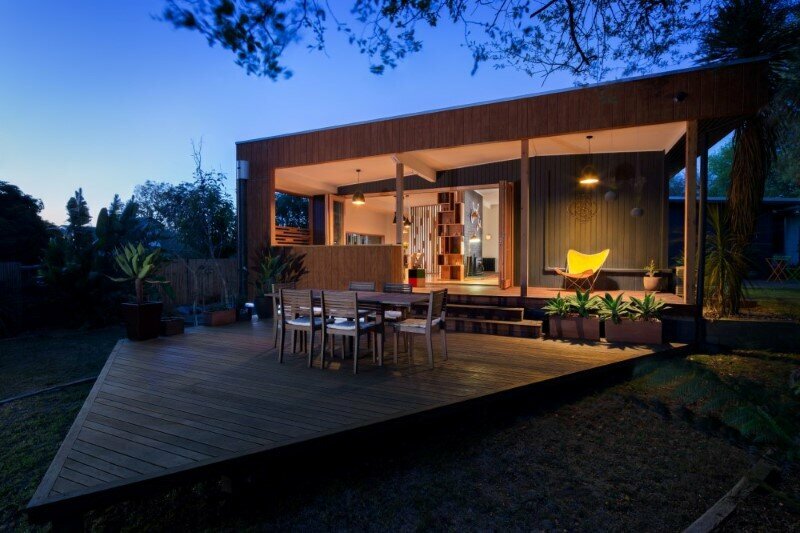 The main access from the east side leads to a single space for everyday family life that opens on the west to the garden. Beneath is the garden level with the sleeping, working and bath/sauna area. 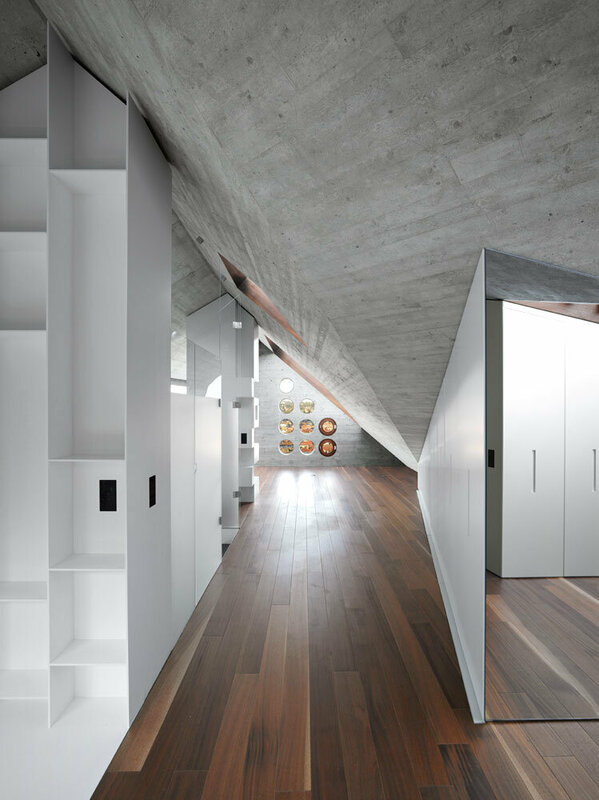 At the attic floor, the vivid geometry of the faceted roof becomes evident; the master bedroom and bathroom are accommodated under higher and lower edge lines, the space reminiscent of a mountain cavern. 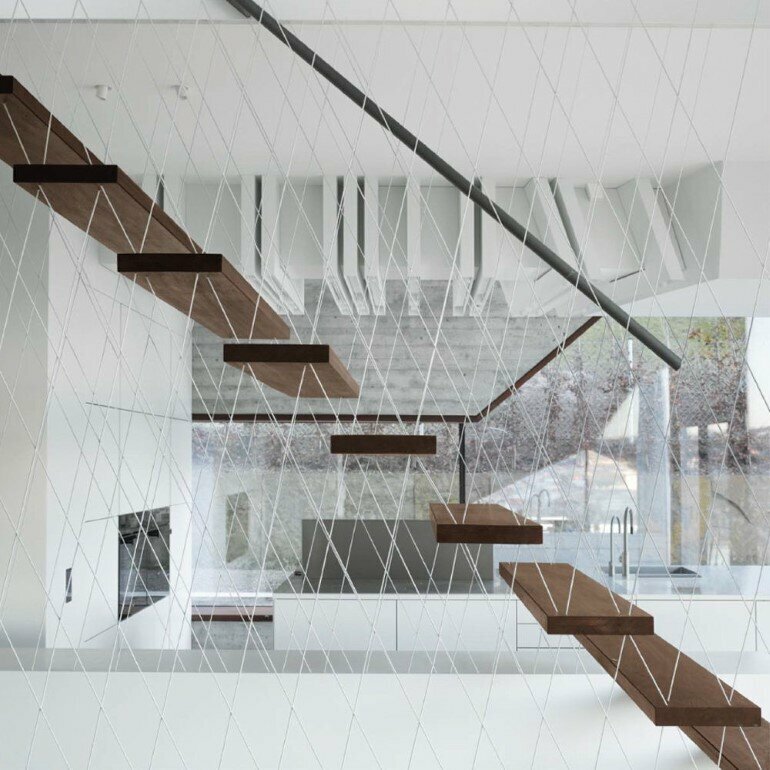 The three floors are connected by a central flight of stairs whose last eleven individual steps leading to the parent’s master bedroom are delicately floating between thin steel wire spider webs with no additional connections. 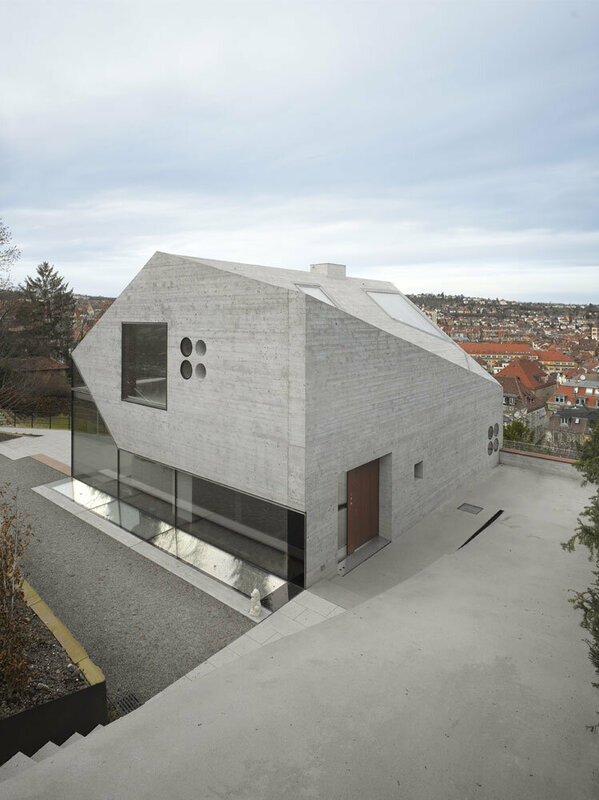 Structurally the house is a monolithic folded shell bearing on two walls. 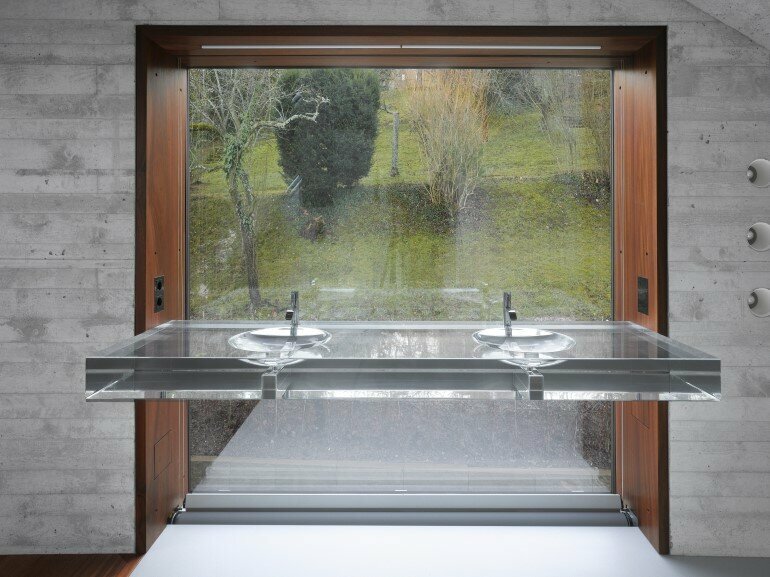 Frameless glass panes placed flush with the outside edges create wide wooden window framings on the inside. 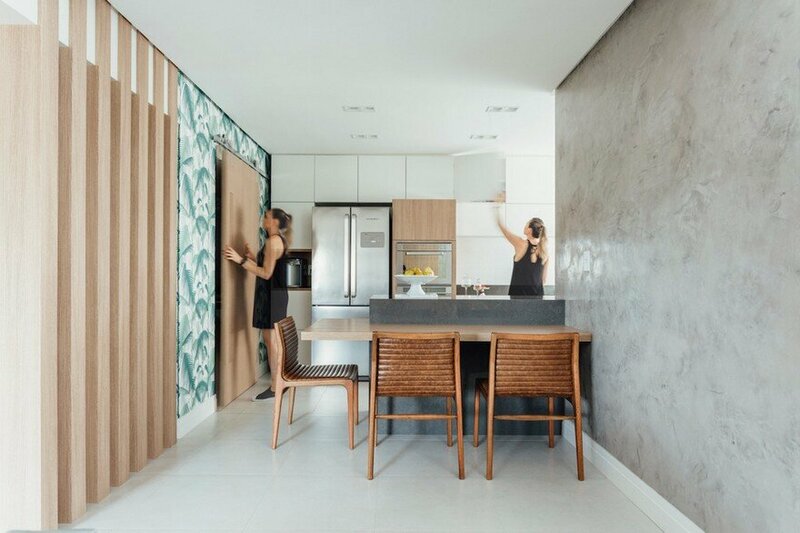 Shelter and domesticity are balanced with large openings bringing light and dimension, connecting inside and outside. 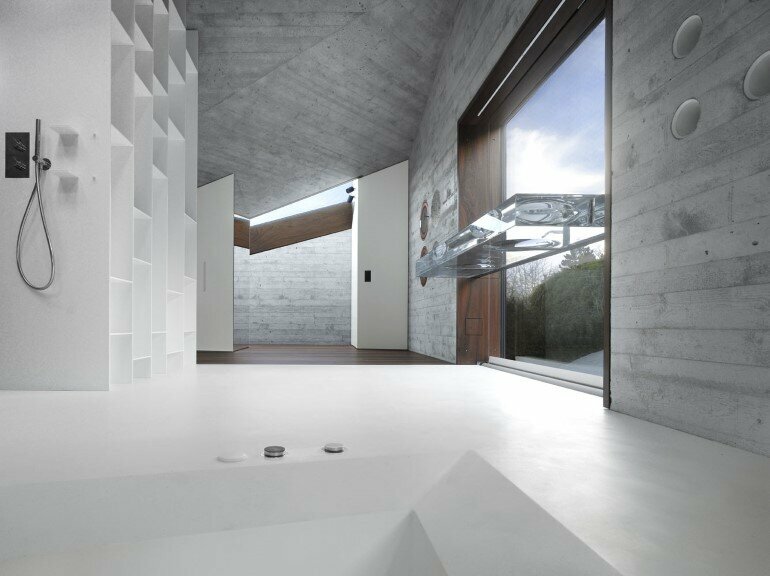 Fields of porthole windows are placed where privacy is required, and over the sunken bathtub create an intense interplay of light and shadow, day and night. 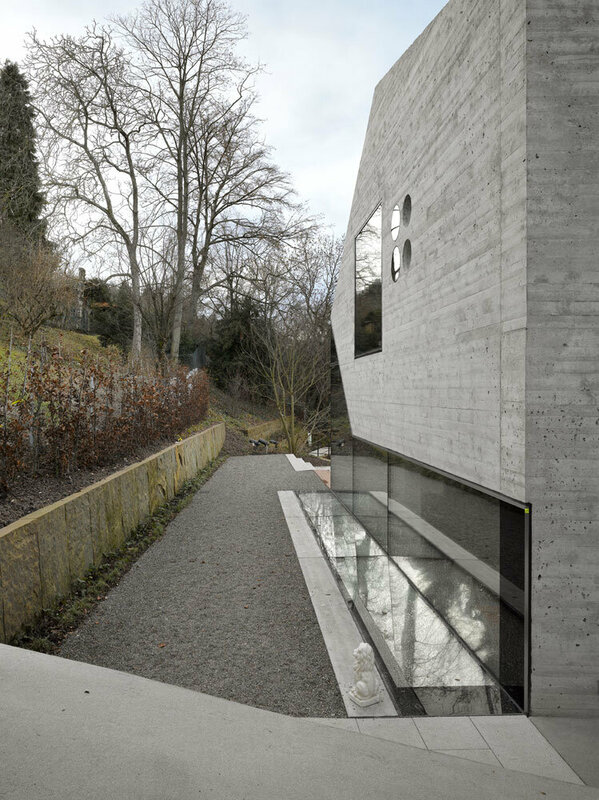 A reduced material canon of glass, insulating concrete, sustainable wood of and mineral material join the rough-sawn concrete surfaces similar to a natural stonewall, haptic and warm. 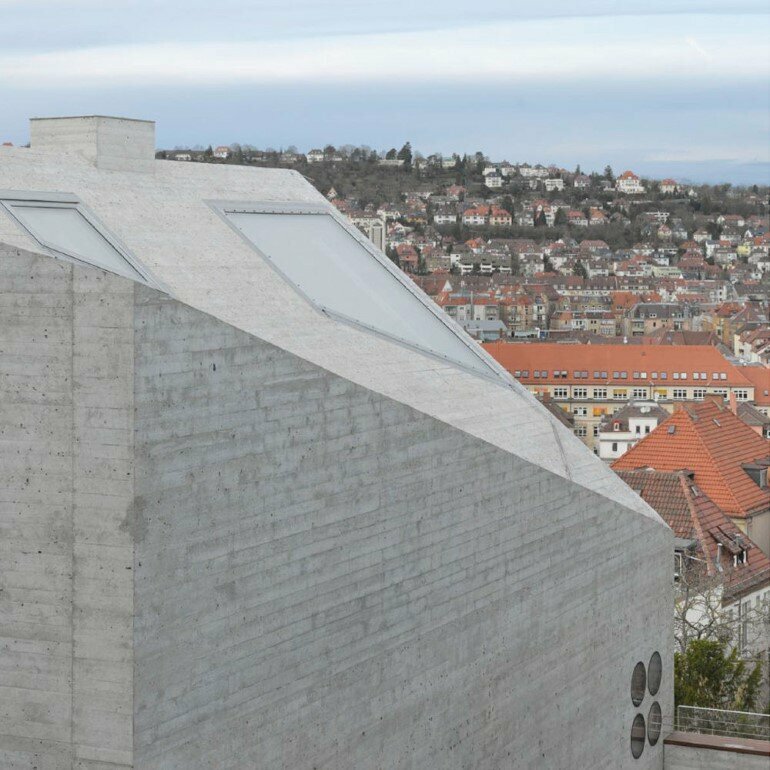 On a modest building footprint of 10x12m for the entire building, the architecture creates a spacious effect. 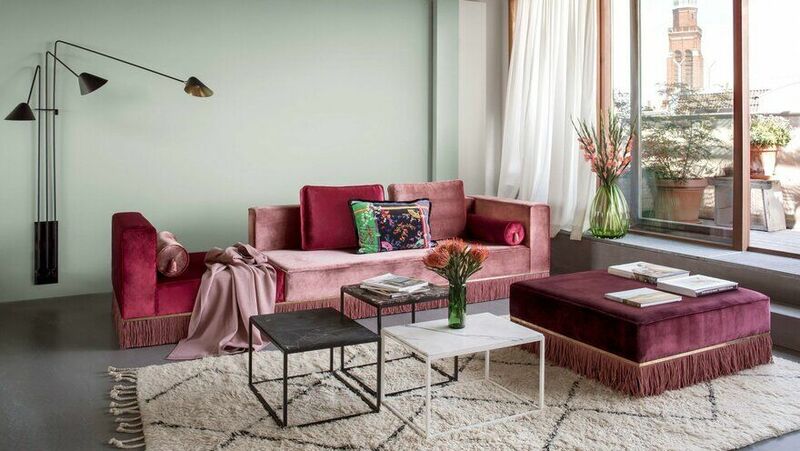 The different moods afford a unique, varied living experience. 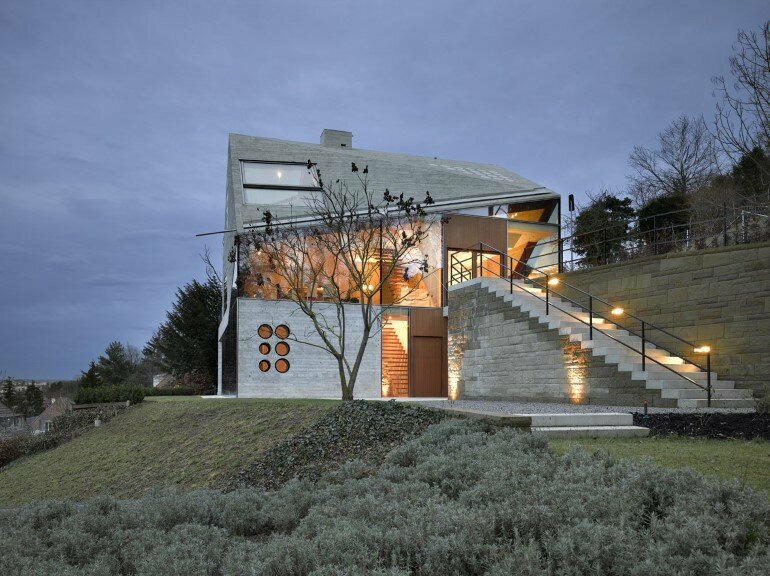 House 36 (re)unites architecture, structure, insulation and systems in a one layer concrete-stone. 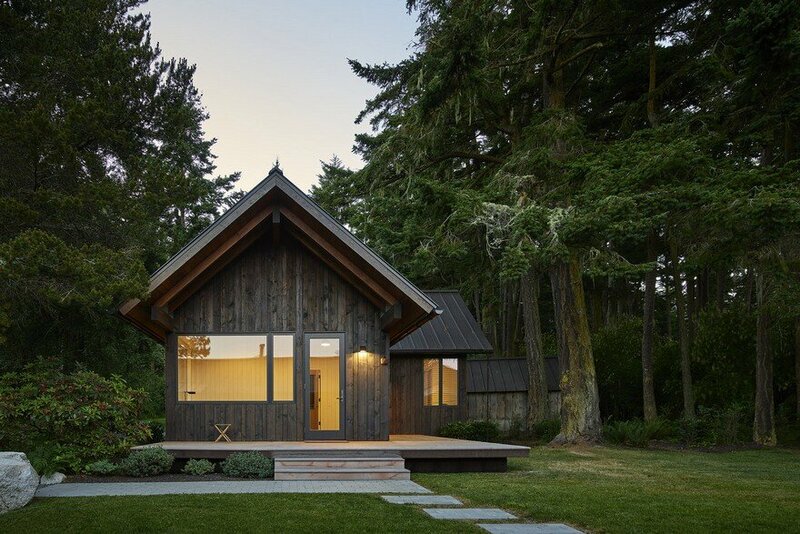 With only two materials made from natural or recycled materials, the built structure’s environmental footprint is minimized. 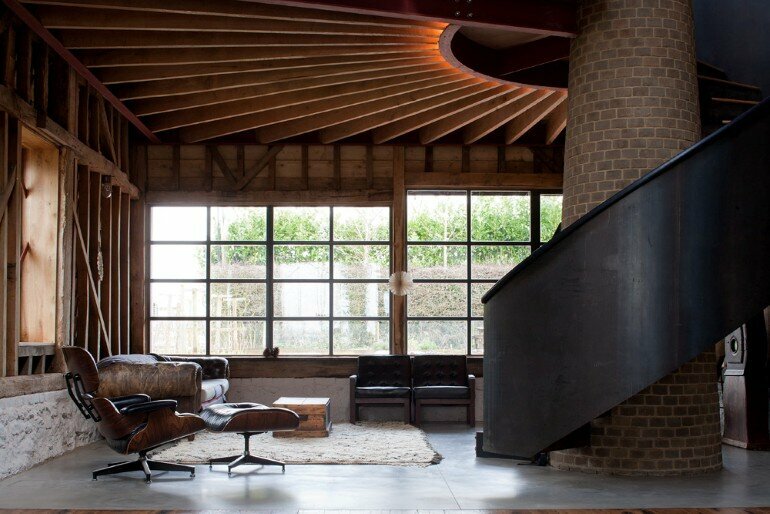 Massive walls and glass allow for active and passive solar and atmospheric gain. 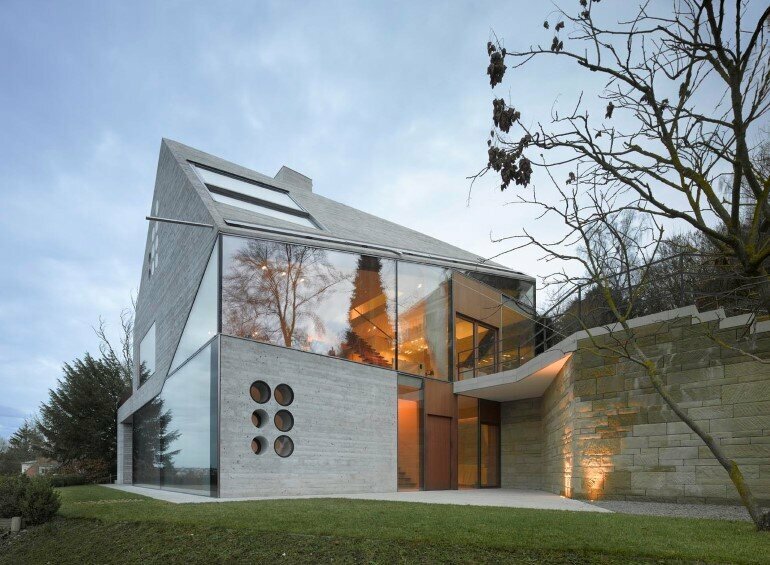 Resulting in a ‘slow’ house – similar to an old stone house – longer warm in winter and longer cold in summer. 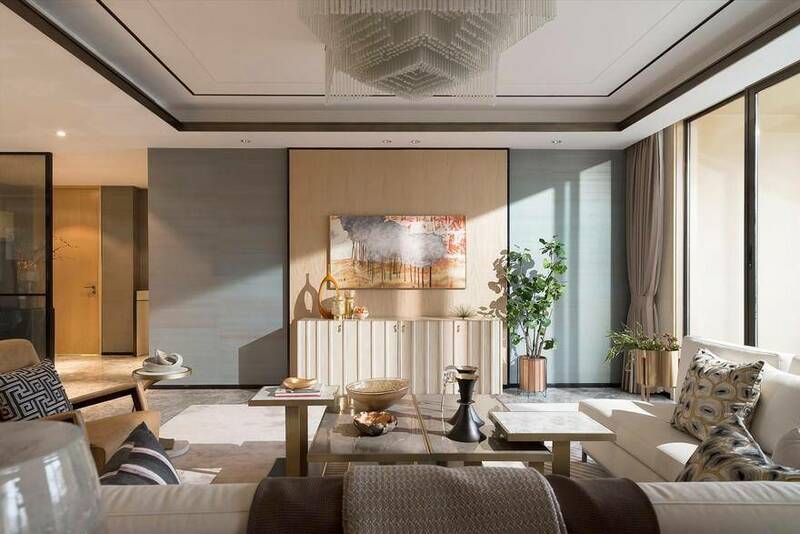 Comfortable room and warm surface temperatures are combined with ideal moisture balance and an absence of traditional thermal problems. Energy consumption and maintenance costs are exemplary reduced. 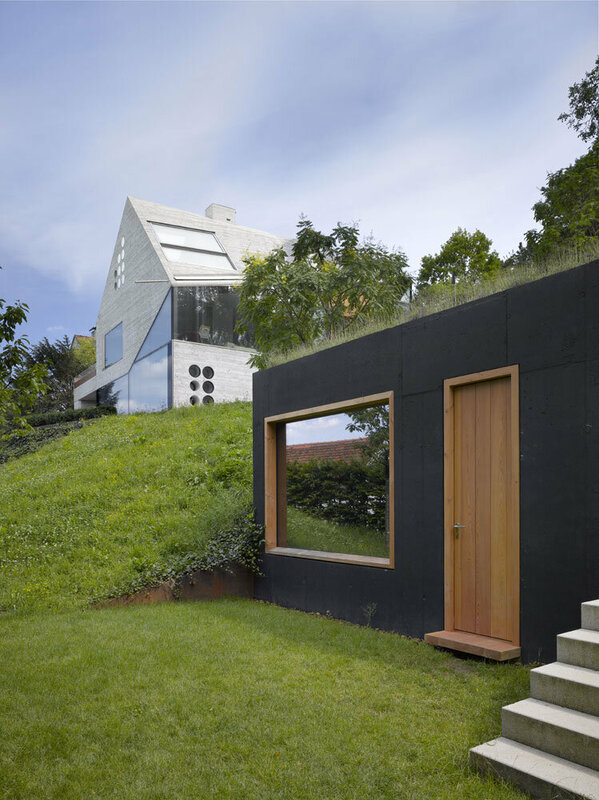 House 36 is a prototype for new holistic architecture.